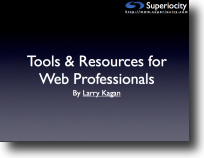 Tonight I gave a presentation on Tools & Resources for Web Professionals. It went exceptionally well. I had a great time and I believed the group enjoyed it as well. It could simply be the candy bars I was handing out, but I choose to believe that they truly found it useful. The group is called the the WebPro 100.